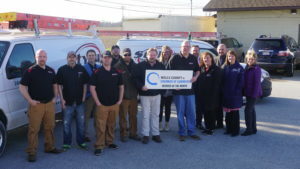 The Wells County Chamber of Commerce staff and Ambassadors honored Rick Elwell, Rob Caylor and their staff of Stylus Technologies located at 961 N Main St in Bluffton, as the April Member of the Month. Elwell and Caylor have been business partners for over 20 years and continue to make an impact in the community. Stylus Technologies have grown their services over the years and are classified as a low-voltage integrator providing technology solutions for commercial applications. Services they provide include door access controls, entry security, video surveillance, data/voice networks, and audio/video solutions. “We also specialize in church technology and K-12 A/V and LED Stage Lighting.” comments Elwell. Many local businesses have taken advantage of the services Stylus Technologies offers such as video security systems at Peyton’s, data lines and door security at Bluffton Motor Works, a plant-wide sound system and providing TV’s and DVD players for boats manufactured at Thunderbird in Decatur, and a variety of technology systems at various businesses. “We take pride that we work with all of the schools in the county with security systems, classroom technology/AV, interactive projects, or auditorium lighting and sound,” says Elwell.